This verse is a prophetic reference to the first coming of Jesus Christ as a baby in Bethlehem. The verb tense is prophetic present. 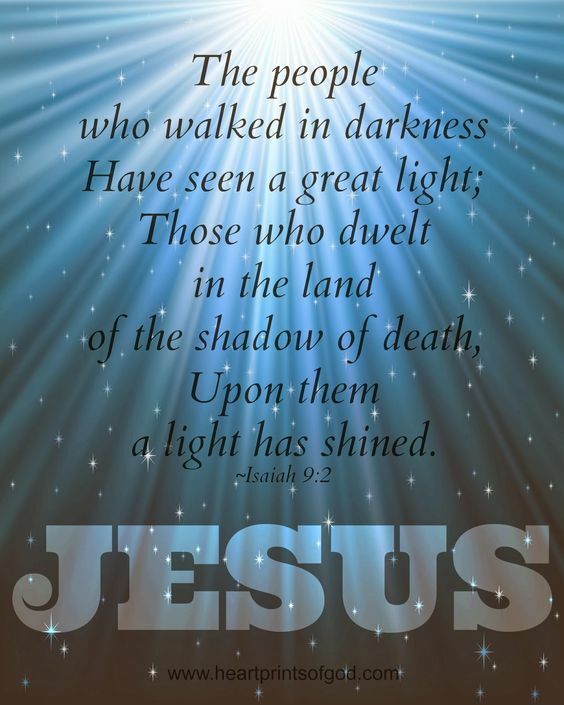 It would be more correctly translated, “The people that walk in darkness see a great light: they that dwell in the land of the shadow of death,upon them a light shines.” The fulfillment of this prophecy is described in Matt. 4:12 -25 and John 2:1-11. Surely, the time of Jesus’ birth, life, death and resurrection was one of the darkest times in Israel’s history. They had, once again, turned away from Jehovah. The religious rulers were far more concerned with their own wealth and in holding everyone else to the letter of their law than they were about the people living in dire poverty, disease, and despair. The yoke of Roman control was heavy indeed, requiring taxes from people who had no money to pay. Imprisonment, torture, and crucifixion were common. It was not a good time to be alive in Israel. The scene was set perfectly for the coming of Jesus Christ, as it will be again when He returns to rule. His timing is always perfect. Did the people of Jesus’ time know that they were seeing “a great Light”? I believe some of them did, but many others’ eyes were blinded. Many more understood after His resurrection.